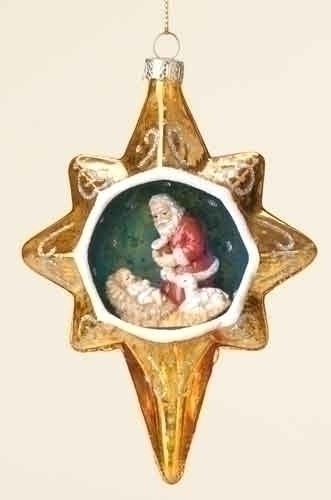 Home > Hallmark Ornaments By Year > 2014 Hallmark Ornaments > Ornaments & More from Roman, Inc > Gold Star Kneeling Santa - by Roman, Inc. Celebrate the true meaning of Christmas with this beautiful gold star ornament. Features a kneeling Santa next to the baby Jesus. I have always loved the idea of Santa kneeling over the baby Jesus. It is so peaceful.Reminds us all of what Christmas Is all about. Kneeling Santa by Roman, Inc. Figures inside the cavity of the star were loose and needed to be re-glued. Wish I had purchased this at the sale price of $3.98 instead of full price. Quality not so hot.